On a quiet afternoon, I can find myself deep down the Pinterest rabbit-hole that is organisational options. Lately I’ve gone on an Ikea and label-maker frenzy to get my pantry in particular, but new apartment on the whole, into an orderly and organised haven. My favourite yearly purchase is my diary – and this year I’ve decided to go for something different – a Kikki-K planner, rather than a one year diary. 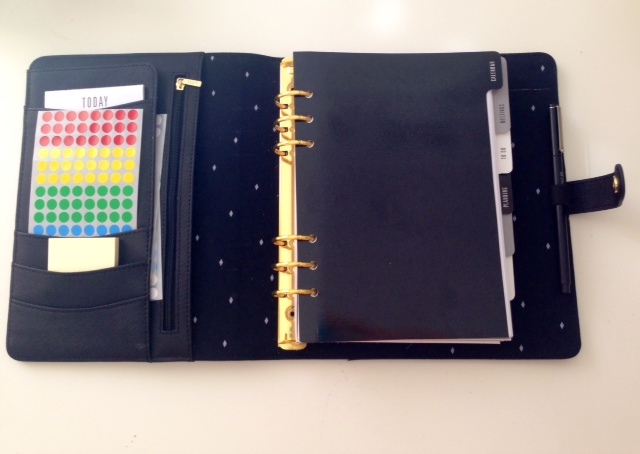 After clicking through the various options – Filofax or Kikki-k? Or the billions of other brands I never knew existed? 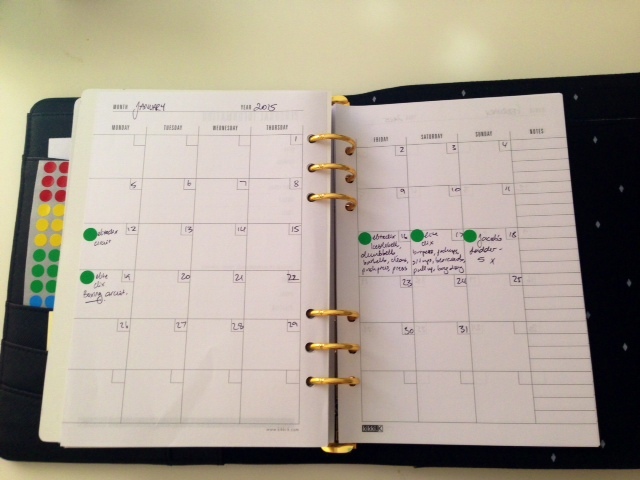 I went to the shops with the intention of purchasing this planner – limited edition gold, personal size, time planner. The gold was gorgeous, but I realised it was probably a bit faddish, and the size for what I was looking for, in terms of the page and week-to-view look was far too small. I also didn’t love the inserts in the time planner – the week-view tab was great, but Birthdays, Shops & Restaurants etc. didn’t really suit my needs. I browsed Kikki-K for a while and fell in love with this beauty, which unfortunately wasn’t on sale, and came it at a whopping $79.95. So I waited a few weeks, and realised that it really was the diary that was going to suit my needs for the year. So as a final splurge, I purchased the beautiful planner and also the 2015 Time Planner Large Insert. 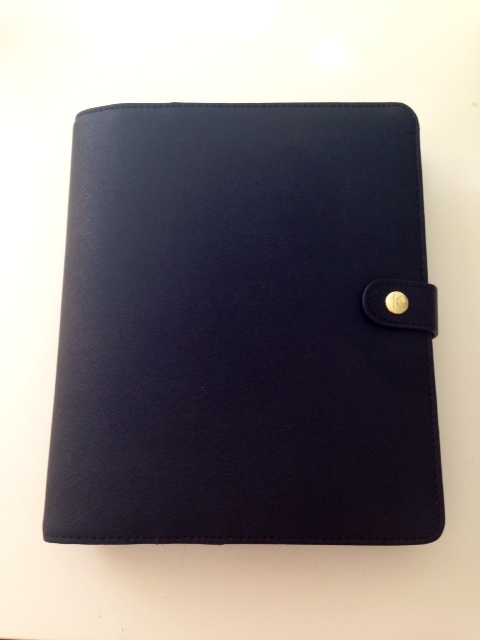 The first thing I loved and still love about this planner is the textured leather. It feels durable, reliable and easy to clean, as well as a really fantastic colour for regular use. Another selling point to me was the press-stud close. 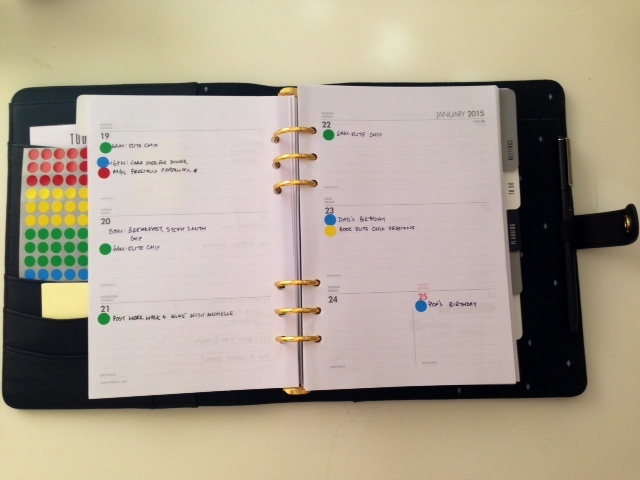 Although an elastic close is probably better for shoving more items into your planner, I preferred the press-stud close, because it gives a satisfying click shut. I was opting for a simple set up. There are some gorgeous and pretty layouts all over Pinterest and Instagram, but I wanted a setup that was simple, functional and applicable for both work and home. In the credit card inserts I have a small post-it stack (my favourite size!) which I use for potential date planning – the sticky lets me reschedule or move things around before I’ve settled on a particular time/date for an event. The dot stickers are from K-Mart, which I use to mark the various things I write in my planner. In the top pocket is the Today pad that came with the planner. I’m not sure if this will stay in my planner forever, but for now it looks cute. Inside the zip I keep my old Driver’s License (it’s come in handy a surprising number of times), and I slot any parcel pickup notifications into the back flap so I can collect them all at once. I do a shocking amount of online shopping! 7. To Action [Perpetual Calendar adapted to tracking all my exercise]. As you can see, I colour-code entries with the dot stickers. Red is important, Yellow is task to be done that day, Green is exercise, Blue is event and there are white stickers but they seem pretty useless on white paper! The refill has been amazing for adapting the Personal planner to a Time planner without having to include inserts I wouldn’t use, and having more blank paper for more versatile use. Just simple – a Green sticker to say boom, exercised, and a short scrawl as to what I did. Let me know what you think – would you do something different? I am desperately trying to track down a transparent ‘Today’ ruler to mark my page in Tab 1, but can’t seem to find one for the A5 size. If anyone can suggest where I can find one, I would be so grateful!